The largest department at Macalester, we graduate a diverse group of 70–90 majors each year. Many Mac students enter with substantial previous work in mathematics or experience with computers; others start with little background. We tailor our program to both kinds of students—there is a place here for you. Block-based programming languages are used to introduce young children (and adults) to programming. However, because they rely heavily on visual elements and drag and drop, they are generally not accessible for people with visual or motor impairments. Google’s Blockly library, in particular, is used to create the majority of the activities for the popular Hour Of Code and is now the basis of the Scratch language. Professor Lauren Milne and a team of students were just awarded a grant from Google to spend the summer making Blockly more accessible (i.e. work better with screen readers and other assistive technology). This project will focus on making the different Blockly elements selectable by a screen reader and making the touch user interface accessible on an iOS tablet. 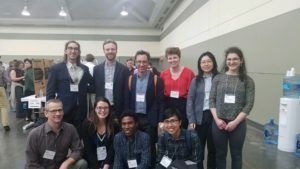 Sam Armon, Tiffany Li Fan, Raven McKnight, Trung Nguyen, Dona Pantova, Jonathan Scott, and Lu Xian attended the Joint Math Meetings in Baltimore in January. 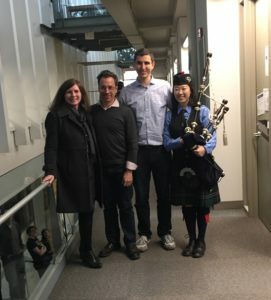 They are pictured here with professors Andrew Beveridge, Tom Halverson, Ian Whitehead, and Lori Ziegelmeier (Tiffany Li Fan not pictured). Armon, Fan, Nguyen, Pantova, Scott, and Xian presented research in the Undergraduate Research Poster Session. Fan, Pantova, and Scott each were awarded “Outstanding Poster” prizes. Armon and Xian each gave research talks at the meeting. David Shuman has been granted tenure. As usual, the department celebrated with donuts and bagpipe music. Congratulations David! MSCS majors, Katya Kelly and Katie Jolly, and 2018 Macalester graduate, Ruth Buck, wrote the following blog post for AMS Capitol Currents about their summer research with the Voting Rights Data Institute at Tufts University: https://blogs.ams.org/capitalcurrents/. Congratulations to Victor Addona for receiving one of the 2018 Trustee’s Awards! This award is given every year to a small number of Macalester faculty for their exceptional excellence in teaching, advising, scholarship, and service. Two Mac student projects win an Honorable Mention in the Undergraduate Research Project Competition (USRESP) sponsored by the American Statistical Association (ASA) and the Consortium for the Advancement of Undergraduate Statistics Education (CAUSE). See here for more details about this competition: https://www.causeweb.org/usproc/. Congratulations to Phuc Nguyen, Jina Park, Tiffany Fan, and Haolin Chen! Brent will be our Math and Society Speaker this fall on October 18th, 2018. Karen Saxe will be a panelist on a Webinar for the National Academy of Sciences on the topic of “The Mathematics of Redistricting.” Professor Saxe will join Jonathan Mattingly to discuss the mathematics of political redistricting — the process of redrawing congressional and state legislative electoral districts.This is part of the Mathematical Frontiers Webinar Series. It will be held May 8, 2018 at 2 p.m. ET. You can join the webinar here. Andrew Beveridge as recently promoted to full professor. The department celebrated with bag pipe music and donuts. Congratulations Andrew! Macalester’s Public Health Scholar Bowl team of: Annalivia Robinson, Emily Hodel, Euijin Kim, Kelsey Porter, Quinn Rafferty, Thao Hoang, and Caroline Duncombe won 1st place in the “Case Study” competition at the 2018 Public Health Scholar Bowl, held at Saint Louis University. 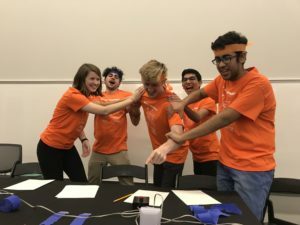 The Public Health Scholar Bowl is an annual competition where teams of undergraduate students come together from around the country to compete in Case Study and Trivia Bowl categories. The 2018 competition marks Macalester’s 5th time competing in the Public Health Scholar Bowl, and our 5th consecutive year with a prize. John’s Hopkins took home 1st place in the Trivia Bowl category. Congratulations to our team! Math Jeopardy is an annual event hosted by Augsburg University. 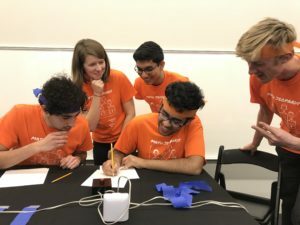 Teams from Macalester, Augsburg, Concordia College, and the University of St Thomas compete in this fun Jeopardy themed competition with questions that range from math in pop culture and history to challenging math puzzles.